Come visit with the IDNR at the Illinois State Fair! 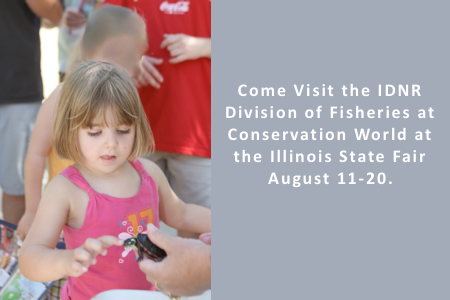 Free activities for children and families will give State Fair visitors a chance to sample the great outdoors in Illinois at Conservation World. Conservation World is a 30-acre park with grass, shade trees, and ponds located on the northwest corner of the Illinois State Fairgrounds. Come visit with the Division of Fisheries and participate in the many activities planned, including fly fishing clinics; fishing for large small and largemouth bass and channel catfish; urban fishing pond clinics for 8 year olds and older; Touch a Fish where young people get to hold live fish, turtles and crawdads; bowfishing display; and much more! 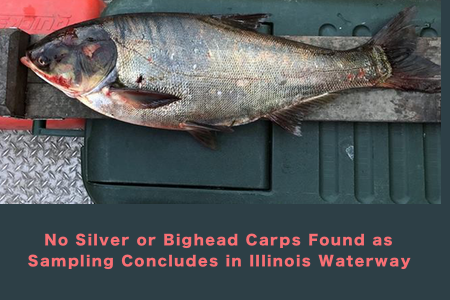 Following the June 22nd capture of a lone silver carp in the Chicago Area Waterways by one of our contracted commercial fishers, the partners began a rapid response looking for additional Asian carp. Entitled Operation Silver Bullet, this response entailed intensive sampling in Lake Calumet, Calumet River and Little Calumet River the weeks of June 26th and July 3rd. No additional Asian carp were observed or collected. A copy of the news release can be found here. Note the operation summary and the effort that was put into this operation. Equally important, safety was of upmost importance during this exhaustive and professional operation. Fishing in Illinois is HOT! 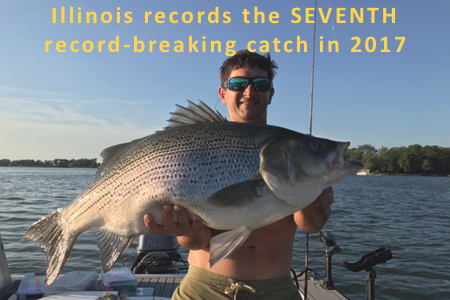 We have just had ANOTHER state-record breaking catch, making seven recorder breakers in 2017! The newest state record is a 21 pounds 7.2 ounces hybrid striped bass, caught in Lake Bloomington. This fish surpassed the previous record holder by over a pound! Other state-record fish included: Lake Whitefish (7 pounds 8 ounces); Burbot (9 pounds 4.8 ounces); Hybrid Crappie (4 pounds 8.8 ounces), and Brown Bullhead (3 pounds 4.8 ounces). Congratualtions to Ken Maggiore (who caught the Burbot and Lake Whitefish during the same fishing trip to Lake Michigan),Ryan Povolish (hybrid crappie), Dan Norris (Brown Bullhead) and Robert Vericella (hybrid striped bass). See the state records here. If you haven't gotten your fishing license for the year, be sure to go pick one up and get fishing — there are records to be broken! 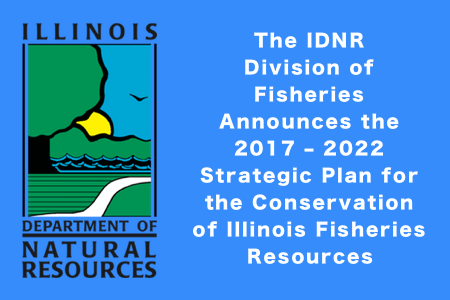 The Division of Fisheries recently completed the 2017 – 2022 Strategic and Implementation plans. These overarching plans give guidance to the Division's annual work plans, as well as direct the Federal Sportfish Restoration grant requests. By law, the mission of the Division of Fisheries is to conserve and enhance the state fisheries and aquatic life resources. Read the plan to accomplish this mission here. Throughout the year, many people operate motor-driven watercraft on the Illinois waters and many operate for the first time. We encourage individuals – both novice and experienced – to take the course. – Persons at least 12 and less than 18 years may not operate a motorboat with over 10 horse power without a valid Boating Safety Certificate. Instructor-Led (Listing of education courses by county). Remove, Drain, Dry: As the boats come out of storage, we'd like to remind you to be aware of invasive species that pose a threat to our lands and waterways. 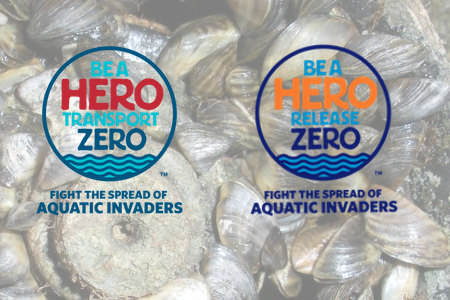 To fight the spread of aquatic invaders, the IDNR is asking residents to "be a hero transport zero." The best way to stop the spread of invasive species is to remove, drain, and dry your boats after use in any Illinois waterway. Learn more here.